A London mother from Oval has spoken out for the first time about her ‘Miracle baby’ to mark Children’s Heart Week and to thank ECHO - Evelina Children’s Heart Organisation and Rainbow Trust Children’s Charity – two organisations she says she could not have coped without. Stephanie was just 20 weeks pregnant when she was referred to ECHO and told that one of the arteries in her baby’s heart was not fully developed. When her daughter was born, Stephanie called her Miracle because, against all the odds, she had survived. Miracle proved to be a little fighter when she underwent open heart surgery at two weeks old at Evelina London Children’s Hospital. Although she will require further surgery when she is older, Miracle is doing well as she now approaches her first birthday. It was at the hospital that Stephanie was introduced to Rainbow Trust Children’s Charity, which in partnership with ECHO has established the UK’s first ever Cardiac Support Worker role. Through this new role the charities aim to bridge the gap between the medical care a family receives in hospital and the emotional and practical support they require when they return home to care for a child with a life threatening or terminal heart condition. Diana, ECHO and the Rainbow Trust’s Cardiac Support Worker, offers both emotional and practical help. A trained psychologist, Diana is well equipped to assist families experiencing the most difficult of situations, having a child with a serious heart condition. “Miracle has two brothers and a sister aged eight, three and two so when she was diagnosed with such a serious heart condition, I had no idea how I was going to cope, especially when Miracle was well enough to come home. We met Diana, our Cardiac Support Worker, when we were discharged from the Evelina London Children’s Hospital. The doctors and nurses sat down with me and discussed what kind of support I would need. It was such a relief. “When I am at home, Diana will take Sherray to the park and Ezekiel to nursery – it makes a big difference having that kind of help, without it, I think my other children would have suffered more. It means I can devote my time to Miracle and not feel guilty as I know my other children are safe and getting one on one attention. I feel bad not being able to give them all the attention they need but Miracle needs me constantly. 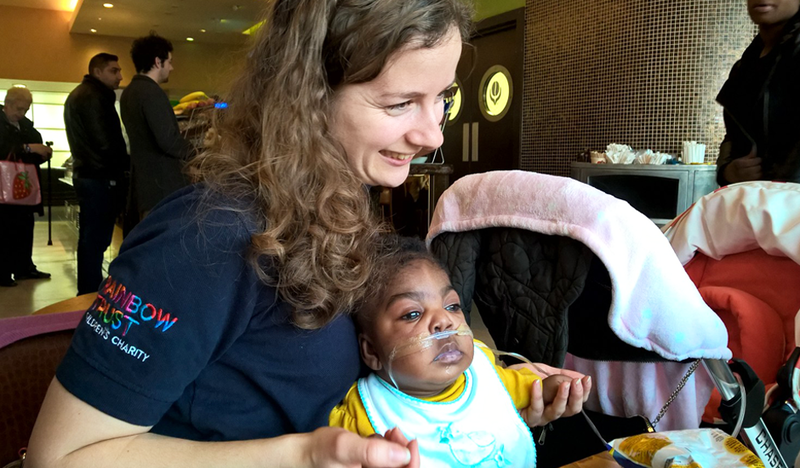 It also means the older ones can still do all the things they enjoy so they feel less affected by Miracle’s condition.” Stephanie, Miracle’s mum. Stephanie has chosen to speak up about the support she has received from ECHO and Rainbow Trust to highlight Children’s Heart Week – which runs from 8 to 15 May to raise awareness of children’s congenital heart conditions. Evelina Children’s Heart Organisation (ECHO) and Rainbow Trust Children’s Charity have formed a three year partnership to offer families a sense of security by providing expert care and support once they leave hospital, whilst working hand in hand with some of the country’s leading cardiac specialists. ECHO provides comprehensive support for children with heart conditions and their families, who have been treated at the Evelina London Children’s Hospital. ECHO helps from the point of diagnosis, which is often during pregnancy, through to the child’s teenage years and beyond. Children with heart conditions often face an uncertain future, where medical tests and treatment become normality – ECHO exists to support families throughout their heart journey. Are the needs of a neonatal parent different to a parent with a terminally ill child?